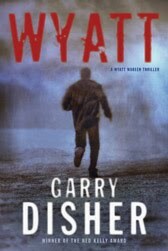 Disher won the Ned Kelly Award for Wyatt but I thought it was a bit of a feeble effort. Very much a throwback to a way of writing that was in vogue in the 80's. His attempts to portray booming Melbourne and the filthy rich Mornington Peninsula as hotbeds of blue collar crime were, to my mind, somewhat strained. I did like his depiction of the Melbourne police as lazy and incompetent - that seems right on the money. Well, I've barely started Wyatt; let's see how it turns out. If the novel has much to say about police, by the way, this would be another departture from Richard Stark and Parker. It's difficult for writers to be original, almost impossible. They're always "borrowing" from one another. It's inevitable. Even the hybrids are getting worn out. Still, good writing is good writing. As long as you can get the reader to care about a character, you have it made. You’re right. But the Wyatt/Parker question is no mere matter of one writer showing the influence of another -- as, indeed, Donald Westlake (Richard Stark) himself acknowledged Dashiell Hammett’s influence. Disher liked to play literary games, and the Wyatt/Parker thing is one more of those , at least at the start of the series.